Although October is the month when temperatures really start to drop I think November is the month when the need to cosy up at home really kicks in. The clocks have just gone back, winter is nearly here and it's almost acceptable to start thinking about Christmas. So Birchbox's 'Cosy at home' theme is just perfect for their November box*. First up there's a full size Dr. Jart+ Most Moist Water-act skin mist worth £18. This is an antioxidant-infused refreshing facial spritz for boosting skins internal moisture levels. My skin is dry and in the winter can become very dehydrated so any products that will help to try and get some moisture back into my skin are welcome. Although I haven't tried any Dr. Jart+ products before I have heard good things about them so am looking forward to giving this a try. The name is a little unfortunate though! The only makeup product in my box was the Lord & Berry mini bronzer. I'm a big fan of their lipstick crayons, which I think are on par with MAC lipsticks but considerable cheaper, so I'm more than happy to try some more of their makeup products. I will admit I've never actually tried a bronzer before, but I will be giving this a try. The only issue I have with this is that it doesn't come in any packaging, you just get the loose pan. If you have a Z palette then obviously you can just pop it in there, but if you don't (like me) then I'm not sure how you'll store this. This is the only product I think doesn't quite fit into the 'Cosy at home' theme, although I guess we all get a bit pale and pasty in the winter and need something to add a little glow. The two little pots contain the Beauty Protector Protect & Treat hair mask. This is a luxurious mask containing argan oil, honey, amber and even crushed pearls! The directions say to shampoo hair as usual, apply to the roots and leave for 5-10 minutes for normal to oily hair and 20 minutes for dry hair, then rinse. Although there are two pots included there's not an awful lot of product there, so you may only get one or two applications from the sample (it will depend on how much hair you have), but this sounds perfect for a cosy night in pampering. Next up is a sample of Weleda Pomegranate creamy body wash. I'm a big fan of Weleda products and they're actually based not far from me in Derbyshire, so I'm pleased to see this in the box. This has a lovely refreshing pomegranate fragrance that would be great for washing the day away when you get home from work. I haven't tried it in the shower yet but the creamy formula feels moisturising so you may be able to jump out the shower and straight into your warm cosy PJ's. I'm sure most of you are probably lip balm addicts like me, especially in the winter when the cold gets to work making them dry and sore, so I was pleased to see the Lip Glam 100% natural lanolin lip balm in my box. I've tried many different lip balms, but haven't come across this one before, and I'm always willing to try new ones. This is really quite a thick balm, you have to squeeze quite hard to get it up to the applicator, so I have high hopes that this will be perfect for the cold winter months. The back of the tube also informs me this can be used on your cuticles, as an eye brow balm, for smoothing split ends and on elbows, knees etc. Finally, this months lifestyle extra was a mini bar (30g) of Montezuma's chocolate. It's not included in my picture above because, well, I ate it! 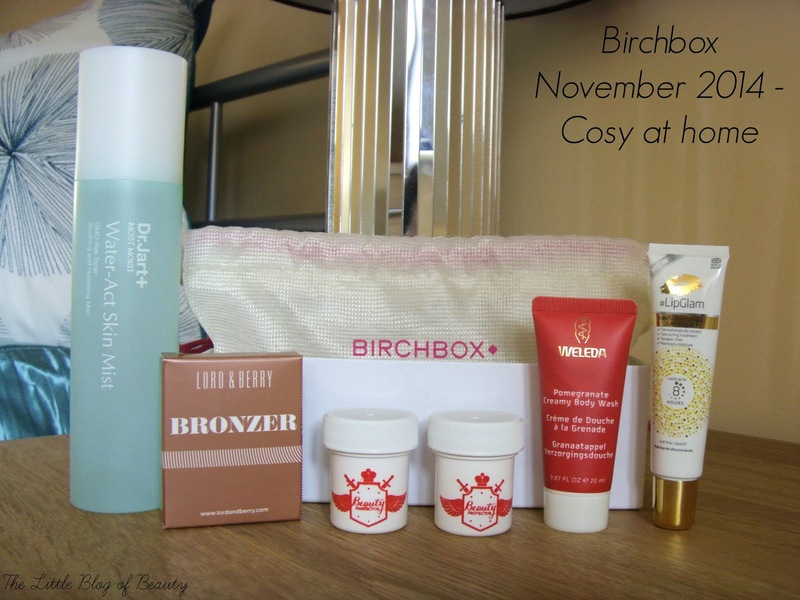 I'm really pleased with this month's box and will definitely be trying all of the products. The only thing I'm disappointed about is that I didn't get a mini OPI nail varnish in my box. This is a duplicate product, as there was one in the June box (although I didn't like my shade) but I will never say no to another OPI varnish! 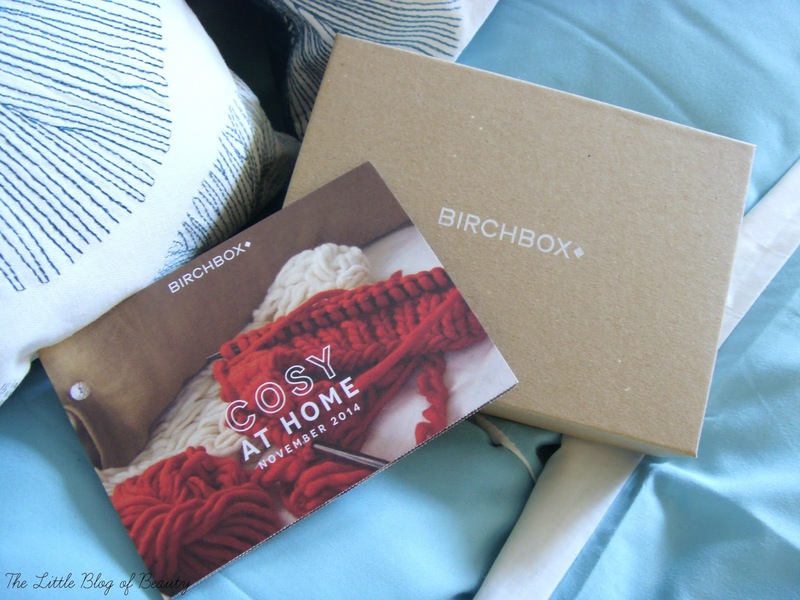 Birchbox have very kindly given me a code for free shipping on your first Birchbox. Just pop over to the Birchbox website, sign up and enter the code BBXLITTLEBLOG. I've been meaning to try glossy box for a while, I've just purchased the harvey nics limited edition box so fingers crossed it will be good.